I am so linear — it is my training and background as an engineer. Duh!! It finally occurred to me yesterday that I don’t have to do everything in exactly the order that Charles Brock does it on the DVD. It was such a relief finally to realize that I could actually make the gluing form for the rockers before I was ready to shape the front legs. 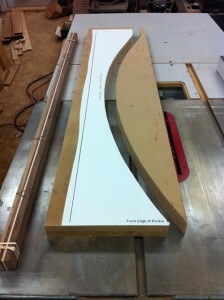 I made the form from a double layer of three quarter inch MDF using the outline included in the plan sheets. I glued the rocker strips together with very little trouble and left them overnight and the rocker turned out really well. I took it out of the form this afternoon and it looks just like it is supposed to look. I have gotten the left front leg pretty much in shape. I cut it to the pattern using my bandsaw and then put it on the lathe and rounded it off and drilled a hole in each end according to the instructions. I think it looks good, but I did hit the first minor snag with the kit. The legs are supposed to be a full two inches thick but they are actually less than 1 7/8 inches. 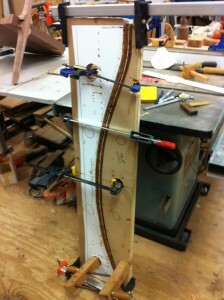 When I measured for the center turning point on the end of the leg, the book says to come in 7/8 from the outside. It didn’t look right so I went back and looked at the DVD again, and in there the center point is measured from the inside. I did not have enough room to make it add up so I adjusted to the outside and moved ahead. I will make sure the other leg matches the first. I think it looks good and I will take a hint from Charles, chalk it up to artistic license, and make the chair my own. I stuck all the legs onto the seat this morning just to get the scale of it. This chair is big! 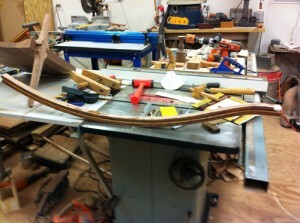 Looking forward to continuing on the other front leg, gluing up the other rocker and moving to the rear legs. We may see the legs attached next week! 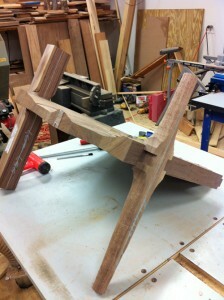 Click here to read about Terry’s next step in building the Maloof Inspired Rocker. The Plane Facts: Using a Smoothing Hand Plane The Down to Earth Woodworker: Is Your Workshop Prepared for a Disaster?